Barrick Gold Corporation is the gold industry leader, with interests in 25 operating mines and a pipeline of projects located across five continents, in addition to large land positions on some of the most prolific mineral districts. Its vision is to be the world’s best gold company by finding, acquiring, developing and producing quality reserves in a safe, profitable and socially responsible manner. Barrick Gold is also an information technology leader. Barrick Regional IT Infrastructure Manager Paul Jones came up with the concept of the ‘mine in a box’ server, storage and virtualisation solution to simplify the IT requirements of its operating mines some three years ago, and has since presented his concept to other resources industry leaders such as Rio Tinto and BHP Billiton. When Paul needed assistance in developing a new ‘mine in a box’ solution for Barrick Gold’s Cowal gold mine in central New South Wales, he chose Stott Hoare. “We designed the solution, with Stott Hoare providing invaluable assistance throughout the process, from helping quantify the total cost of ownership (TCO) and return on investment (ROI) for the business case, to flawless supply and on-site implementation and installation,” said Paul. “Barrick’s ‘mine in a box’ concept simplifies IT support for the administration of an operating mine,” said Mick Severn, Stott Hoare Solutions Architect. “For Cowal, the Barrick team wanted to maximise the benefits of virtualisation, consolidation and the most current technologies. We could utilise existing switching, cabling and VMware virtualisation solutions. “However, because Cowal is a fully functioning open pit gold mine – Barrick was looking for ‘bullet-proof’ reliability and robustness. Should one piece of hardware ‘go down’ the system had to continue to function. Stott Hoare scoped the solution and submitted a proposal for purchase, delivery and on-site implementation and installation. 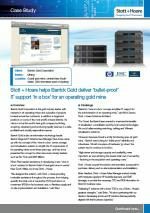 Brian Hawkins, Stott Hoare Sales Manager worked closely with hardware suppliers HP Australia (servers), and EMC (storage), to provide the necessary TCO and ROI information for Barrick’s business case. Three HP ProLiant DL380 G6 Servers were chosen for their combination of engineering excellence, very high levels of flexibility, performance and uptime, and ‘rackability’ for compact on-site installation. “Most critically, the HP DL380s have developed an enviable industry reputation for rock-solid reliability,” said Mick Severn from Stott Hoare. Intel® Xeon® Processors with Intel Turbo Boost technology allowed customised optimisation of power consumption and performance, a further Barrick requirement. HP Insight Control infrastructure management allows remote management of server health and power management, and the System Insight Display slide-out diagnostic display saves on-site administrators time by providing easy access to troubleshooting information at the front of the DL380 server. An EMC CLARiiON CX4 – 120 storage array with 7 terabytes RAW disk capacity provided the networked storage capacity required for Cowal at a cost that represented an excellent balance of price and performance. The server and storage options chosen were ideally suited to VMware virtualisation technology, and both offered flexibility and easy scalability should Barrick’s needs change in the future. Stott Hoare worked closely with Barrick Gold throughout the Cowal solution development and implementation process. “It was a strong partnership that delivered significant benefits for Barrick,” said Brian Hawkins. “Although Paul Jones and his team took a major role in the solution design – they wanted to completely outsource the build, implementation and commissioning to Stott Hoare. “As I’ve mentioned, we helped support Paul in presenting his business case internally, particularly in respect of the lower total cost of ownership the solution offered. That effort represented quite a bit of work on our part, but it’s something Stott Hoare is happy to do – it’s all about adding value to our client partnerships. “We also managed the supply and delivery of the solution, and then sent a Stott Hoare technician to the Cowal minesite to complete the implementation from unboxing and racking up, to installation and integration, to on-site training and handover,” concluded Brian. “As far as we were concerned, the whole process was excellent,” said Barrick Gold’s Paul Jones. “Stott Hoare provided everything we were looking for professionally and smoothly. The new Cowal ‘mine in a box’ solution has gone to plan beautifully, and it has now been working flawlessly for about 12 months. “So that’s it really, the proof of the pudding – as they say – is in the eating,” concluded Paul. Virtualisation, servers and network storage are very much the catchcries of today’s IT environment. If you’d like to talk to someone who can deliver innovative ‘real’ solutions that are tailored to your business objectives, talk to Stott Hoare. Contact us on (08) 9244 0000.